Thanks to the avNav free software, the Raspberry Pi becomes a control center for electronics on a yacht. The Raspberry Pi (Rasp Pi) plus a television has served as an energy-saving multimedia center  and an excellent low-cost navigational device  for a small cruising yacht on inland waterways. Recently, I acquired a larger boat (Figure 1) capable of sailing open seas. Although the "Einstein" is equipped with GPS, an echo sounder, and speedometer, she is missing a contemporary chartplotter, which is quite an expensive device, and has an old, defective radio. The radio antenna at the top of the mast, however, is intact and still works perfectly. 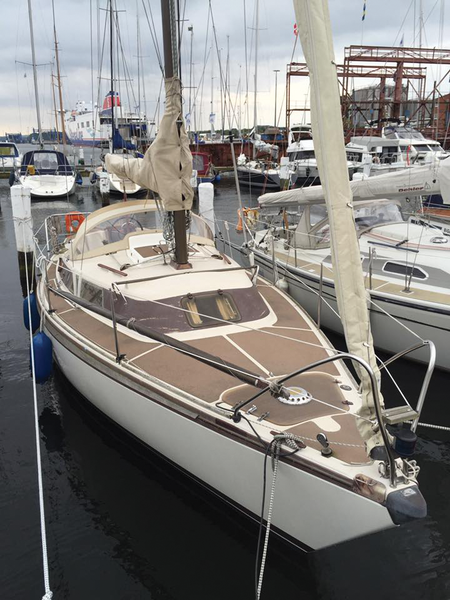 Figure 1: The boat, christened "Einstein," is a 1981 Dehler Duetta 86AS. Because of the positive experiences I had already had with the Rasp Pi on a sailboat, I had no doubts that the small computer could play a central role on an ocean-going boat. In addition to price considerations, I found a reference to a project on a sailing forum that perfectly fulfilled the requirements for creating my own chartplotter – avNav. Vogel has placed avNav under an open license and offers the program on GitHub for downloading , and he made available easy-to-install images based on Raspbian. Basically, everything seemed easy. The various measuring instruments transmit their data to the Rasp Pi that is running avNav. The little computer collects all of the metrics, prepares them, and as a last step offers the browser compatible navigational software. Unfortunately, theory and practice veer apart sharply at this point. In practice, it quickly became clear that the description "easy" was not applicable. For a navigation system to work properly on a sport boat, the system has to receive measurements from various instruments. The most important of these instruments have already been mentioned. The navigational system retrieves information on location, speed over ground (SOG), and the current course via GPS. The speedometer answers questions about speed over the water (SOW) and makes it possible to determine the difference between perceived and actual speed. Thanks to the echo sounder, the navigational system knows where the water is too shallow for the safe transit of the boat in question. Out on the high seas, a radio becomes the best way to request assistance in the case of an emergency, so the lack of a functioning radio is problematic. Most higher end radios have an integrated Automatic Identification System (AIS) receiver. Both small and large boats transmit data via FM radio about their boat, the route traveled, and the current position. A navigational system uses this information to identify other boats, their distance, and whether the danger of a collision exists. If so, the system will typically give off both a visual and audio warning. Therefore, an FM radio is an essential piece of equipment, serving as an AIS transponder and an emergency contact system for an additional measure of safety. Ultimately, I selected a B&G V50 for the "Einstein." This radio works on inland waterways with the Automatic Transmitter Identification System (ATIS), which is used to identify signals emitted on inland waterways using a 10-digit ATIS code assigned to each boat. ATIS is not permitted on the ocean, but the new radio also works at sea with Digital Selective Calling (DSC) and an integrated AIS receiver. 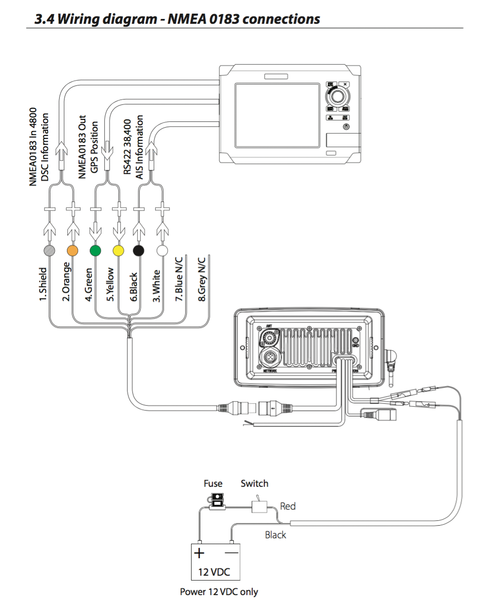 The manual for the device indicates that it can output data via the NMEA 0183 standard, which is an important feature I address later (Figure 2). Figure 2: The manual for the radio clearly states that the device outputs data via the NMEA 0183 standard (source: B&G V50 manual). Although it was clear which devices would output metrics data, it was not clear how the data would end up on the Rasp Pi. The Rasp Pi has four USB connections, one Ethernet port, an HDMI connection, and a micro-USB jack for providing power. None of the devices on board, not even the radio that had yet to be purchased, would be able to communicate directly with the Rasp Pi, because nautical devices do not output data via USB connections. Instead this is done primarily via serial interfaces. To get a better understanding of the situation, I started the process of studying the two protocol standards for nautical electronics on a boat. The Raspberry Pi is ideally suited to serve as the basis for a low-cost navigation system. OpenCPN software and a GPS receiver are all you need to add. Due to its diminutive size and minimal power needs, the Raspberry Pi works well as a multimedia center on boats or in RVs. It is rumored that Thomas Edison tested thousands of filaments for an incandescent lamp before he produced the first commercially viable electric light bulb, and I imagine his is not a unique experience. Building mock-ups and working models exposes the weaknesses and strengths of a design, which prepares you to make a better version, then a better version, until you have found the right combination of materials, components, configuration, and cost.